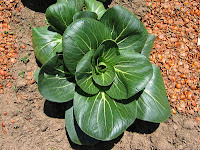 I figured you were getting curious about the new neighbors and their garden, if we're still getting along and have they given us any bok choi. I can answer in the affirmative on both counts, and we've been plying them with wine, beer and dinner invitations to lull them into complacency so that when our evil plan springs into action, they'll be none the wiser. Bwahahahaha! If only we were smart enough to have an evil plan or the focus (not to mention the energy) to spring it on anyone, that is. Alas. Guess we'll just have to wander down to their garden and babble admiringly like everyone else about how big everything is, how handsome the hazelnut-shell pathways look and how well the sharp nutshells are keeping the slugs away. You can take a look at the early garden here for comparison's sake. 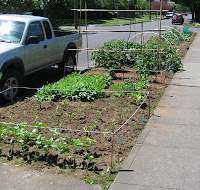 Among other things, there are sunflowers, corn, berries, potatoes, the aforementioned bok choi, tomatillos, romaine and several other things bursting out of the ground. And friendly (and hungry) neighbors waiting to spring into action (or whatever). I don't know what it is about getting published in the newspaper that I find so darn much fun. Is it memories of my parents cutting out the articles and taping them up on the refrigerator whenever one of their kids appeared in the local paper? Whatever the deep psychological significance, I got my second Market Watch column in the FoodDay section of the Oregonian this morning. "The market: Eastbank Farmers Market. 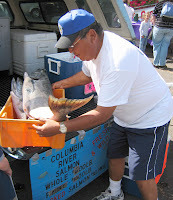 "Columbia River salmon from Simon Sampson the Salmon Man [photo]. (Whole salmon $6 per pound; fillet $10 per pound.) Simon pulls up to the market with his truck full of some of the freshest salmon I've ever seen; huge wild salmon that still smell of the river and large roast-size fillets that would feed a dinner party. Several area restaurants come to the market to buy their salmon directly from him because they know the quality and freshness can't be beat. No need to marinate these in teriyaki . . they're so fresh all you want is a little olive oil, a little salt and pepper, maybe some spring onions and slices of lemon inside. Fabulous! Available most of the season." I don't know about you, but Memorial Day has always been a puzzling holiday for me. I know it's primarily supposed to commemorate those who have died in war. My mother's family always gathered at the cemetery along with all the other families in their small Eastern Oregon town and decorated the graves of relatives. They told stories about Uncle This and Grandma That and remember the time that our aunt's house burned down and someone was seen jumping out a window stark naked? Since my mother married and settled down with her husband and children in a town far away, that tradition wasn't carried on in our family. It was, of course, a day off from school and usually involved a picnic or a barbecue. Nancy Hiss, an instructor at Marylhurst University here in Portland, has decided to commemorate the holiday by writing on sidewalks in sidewalk chalk the names of the more than 3,500 Americans who have died in Iraq since the beginning of the war, in chronological order. She was planning to start at sunrise on Memorial Day in front of the Federal Building downtown and go until sunset. She plans to continue the project through the downtown area, eventually heading over the Steel Bridge to the Peace Park on the east side and then through the neighborhoods. The project will continue from there as the names continue to be added to the list of casualties. We'll keep you updated on her progress and, hopefully, get a chance to talk with her and find out more about why she was moved to take on a project like this, so stay tuned. Call me a mouthpiece, call me a flak, call me a not-so-innocent bystander. I just happen to love Luan and Tim of Foster & Dobbs. Well, them and their cheeses. Oh, and their Ayers Creek Farm jam and their Fra' Mani salametto and...OK...you get the picture. So needless to say I was thrilled to the bottom of my little heart when I heard that they're going to be opening for a happy hour in the evenings that they're calling the Pause. No, ladies, not "the 'pause" like "the change," but it's something that could make that cranky mood smooth out. So if you need a place to stop on the way home and take a moment before the onslaught of the family or need a place to meet someone before going out for the evening, you can take a table outside or, if they've got their wall-o-windows open, at a table in the shop and order a glass of wine paired with a featured treat. Welcome to summer! Details: The Pause at Foster & Dobbs. 4-8 pm, Mon.-Sat. ; 4-6 pm, Sun; $7-$9.50 includes wine and nibbles. Foster & Dobbs, 2518 NE 15th Ave. on the corner of 15th and Brazee. Phone 503-284-1157. 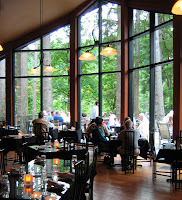 There is a restaurant I'd never heard of, a really upscale place with gorgeous wood paneling and soaring ceilings with a fantastic deck jutting out over the Sandy River. When friends invited us to join them for a birthday celebration there, we thought, "Cool! Let's check it out!" You never know when a gem might appear that changes your personal dining landscape. Then I went to the website of the Riverview Restaurant to get directions and discovered it is owned and was built by Junki Yoshida, wealthy local personality and founder of Mr. Yoshida's Fine Sauces, a line of popular teriyaki-type sauces that have never seemed to find a way into our cupboards. Despite this red flag and a snarky comment from a friend that she hears "there's no charge for extra sauce," I decided to take the high road and go with a positive attitude. The dining room is, I have to say, impressive. And the deck is a place I could while away several hours as late afternoon turns to evening, watching the river go by and the frogs start to sing. It would be a great place to bring out-of-town guests or your relatives for a get-out-of-the-city civilized evening. But then there's the food. 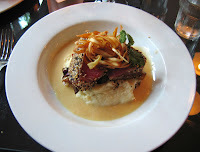 Created, according to the website, by head chef Yutaka Kobayashi as a fusion of Northwest ingredients and Asian influences, the menu is a corporate hodgepodge of stunningly pedestrian selections. And once you make that selection, you're apparently on your own for additional water, utensils or refills of your wine glass, since the service is somewhat lacking in attention or competence. The food does arrive, however, but it's a decidedly mixed blessing. The crab cakes have no discernible crab flavor, my sesame seared ahi tuna was a piece of perfectly cooked, that is to say seared on the outside and barely warm inside, very fresh fish, but it was served on a mattress of lukewarm, not-very-garlicky mashed potatoes floating on a gloppy "pinot Grigio bechamel sauce" that had started to congeal and looked (and tasted) startlingly like the coconut curry cream sauce served on the "Tower of Seafood" entree (both over $20 each). Said tower turned out to be a couple of unimpressively small panko-breaded skewers of scallops and cod on the same "garlic" mashed potatoes swimming in the aforementioned sauce. What this place needs and is sorely missing is a chef who knows how to make ingredients come alive on the plate and on the tastebuds of his customers (like so many of our favorite guys do) rather than someone who covers it all up with ho-hum, unimaginative sauces and sides. So the next time I go out on the Sandy River, I'm heading to Tad's Chicken-and-Dumplings. (Their URL is "tadschicdump." Love it!) At least there I know I'm going to get the same terrific view and their trademark strong drinks and good old-fashioned road food simply prepared, not some pseudo-chichi mashup of overpriced "cuisine." We always have a list of restaurants we'd like to try, places we haven't made it to even though they've been around forever, and then those places that are on the "special occasion" list because they fall into that fabulous-but-expensive category or are just not places you can bop into on a week night in your t-shirt and flipflops. Though admittedly there are fewer and fewer of those where formal attire is expected, much less required. If you've got a special event coming up and want to get a deal on what I consider one of the best, if not the best, restaurants in the city, from now until June 21 Monique Siu and Kevin Gibson are offering $20 off dinner for a group of four people at Castagna, the other half of their equally fabulous but more casual Castagna Café on Hawthorne. Larger parties also get the discount of $5 dinner as long as everyone orders an entrée. Kevin and Monique have been committed to local and sustainable cooking for as long as anyone in town, and there's no one who does fresh and seasonal as well as these two. So get in and get a deal while you can, and tell them GoodStuffNW sent you! 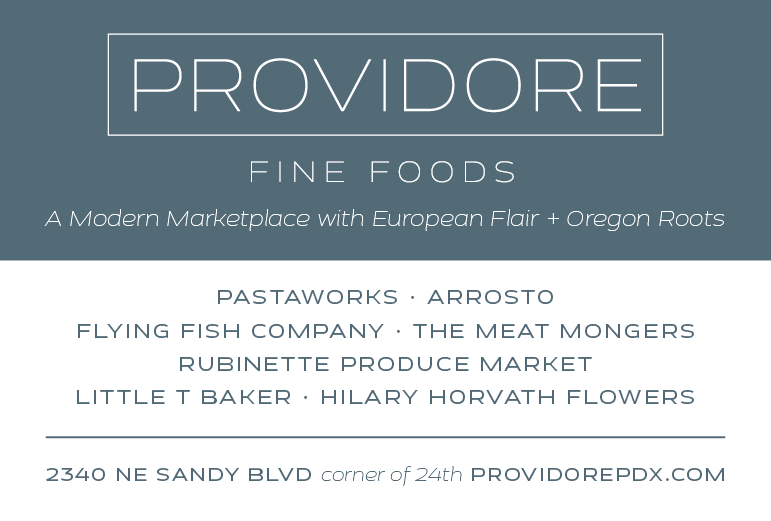 Details: Castagna, 1752 SE Hawthorne Blvd. on the corner of 18th. Reservations are recommended. Phone 503-231-7373. We're all hit by sticker shock when we go to the gas station to fuel up these days, and many of us are thinking twice about dashing to the store or are deciding to ride a bike or walk if we can (not that there's anything wrong with that...). And along with the price of a gallon of gas, it looks like big oil's profits are skyrocketing again. But aside from some grumbling and low-level complaining, from all appearances it doesn't seem to have hit a public nerve. Now it looks like some folks have taken matters into their own hands. Though instead of protests and rallies, they've decided the best route is to steal from their fellow citizens. My husband hopped in his twenty-year-old truck to head to work this morning and saw through his rear window that his gas cap was sitting on the wheel well in the pickup bed. A quick check of the gas gauge revealed that it was down to a quarter tank, well below what it should have been since its last fill-up. So now we're looking into getting locking gas caps, something we haven't had to do since the seventies and the last gas crisis. Is anyone paying attention? If your Fido or Spot needs something to look forward to this summer besides the occasional walk around the block while you talk on your Bluetooth, mark July 14 on your calendar. That's when Project POOCH is hosting their first doggy benefit and "fun raiser" at Mary S. Young Dog Park. There'll be dog races, an agility course, a pet photographer and, if it's been awhile since your dog's last pedicure, nail trimming. Plus many more activities aimed at keeping owners busy while their dogs are sniffing, playing, marking and barking. All proceeds from the party will go to Project POOCH, a non-profit organization that pairs "unadoptable" dogs from shelters with youth offenders at MacLaren Youth Correctional Facility. The kids train the dogs and get them ready for adoption to forever homes while learning life and job skills that help them move out of the correctional system. Details: POOCH in the Park benefit for Project POOCH. Sat., July 14; 10 am-3 pm. Mary S. Young Dog Park, 20100 Willamette Drive (Highway 43, 2 miles from I-205 Exit 8), West Linn, OR. Phone 503-636-0714. There's something about the color green that just shouts spring to me. It happens when I see the first tentative tendrils of my white bleeding heart popping out of the ground, followed by the hostas and anemonies, and then the farmers' markets start up with garlic shoots and tender baby lettuces. 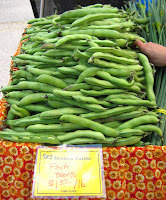 And, my obsession with rhubarb notwithstanding, there's that very short, very special moment when fava beans can be found at the markets and on the menus of many restaurants. The trick seems to be finding very fresh pods with firm, round beans inside rather than faded, floppy things that have lost their luster to too much time in transit. Yes, there is that notorious three-step prep, but, hey, the season is short and the agony doesn't last long. Just remove the beans from the pods, boil them for a minute or two in plenty of water, then shock them in ice water to stop the cooking process. Terrific in salads or tossed with pasta, they also make a vivid seasonal risotto. I like them as a fava bean spread on fresh slices of baguette or on crostini brushed with olive oil and garlic and topped with a tiny mint leaf. So steel yourself and get in while the getting's good. You won't regret it! You know when you get all excited about a project and then at some point it sometimes spirals out of control? Well, we almost had Mercury leaving its orbit and crashing into Venus, starting a galactic pinball game around here last weekend. As part of writing an article for Culinate.com on making paella on the grill (based on the blog entry you all read here), I volunteered to have the photo shoot at the house. My most excellent and talented friend, Mr. Bloch, said he'd do it gratis (thanks, Steve!) and Culinate editor Kim and her husband James accepted our invitation to supervise. Then, of course, I invited my brother Bruce and his partner in crime Wendy. So we're up to, what...three...four...six...eight? And Kathryn and Jeff weren't busy and Tim and Luan had missed the last paella feed opportunity, so that brings us to...EEK!...twelve??? Fortunately the paella recipe is infinitely expandable and Cost Plus has very reasonably priced glassware and table accessories, so with a little creative mixing of silverware patterns, we were all set to go. The evening came off without major hitches (okay, okay...I miscounted and set the table for ten instead of twelve, but we squeezed in two more without too much fuss), everyone had their fill of appies, including, if I do say so myself, a lovely fava bean spread (see above), there was rosé and red wine aplenty with rhubarb crisp and coffee for dessert. As they all toddled off home and Tim zipped off on his new scooter, we sighed and started working through the detritus of yet another successful evening. Now all I have to do is hope that the article I wrote last week measures up! I know that phrase usually refers to something in the sweet rather than the savory category, but when I'm not feeling like cooking dinner or I get preoccupied with blogging and run out of time, it's nice to know my options. And the quickest and closest solution is to have something in the freezer I can just pull out and heat. Since we're not into Lean Cuisine or any of its boxy cousins, I was pleased to find out that next week ¿Por Que No?, that vortex of good vibes on N. Mississippi, is going to start offering their signature Latin American-style tamales frozen by the dozen. 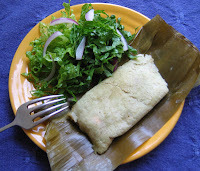 This style of tamale is wrapped in banana leaves that help the corn meal to stay moist and fluffy, not dense or dry. They make a variety of fillings, from vegetable to chicken to pork with almonds and raisins. So you can feed everyone from your "Hey, Mom, I've decided to become a vegetarian" daughter to your meat-loving husband all at once. Call ahead to see what flavors they're featuring and order a dozen for just $30. One or two of these babies and a salad and you've got dinner ready in 15 minutes! Details: ¿Por Qué No?, 3524 N. Mississippi. Phone 503-467-4149. "If cheese-making was rock'n'roll, these guys would be REM." Not only are the young Turks of Jasper Hill Farm shaking the tradition-bound world of cheese-making with their rock-em-sock-em cheeses ranging from Constant Bliss, a creamy-in-the-middle, gooey-at-the-rind little package of deliciousness, to Bayley Hazen blue, a tangy, sweet, velvety cheese that gives our own Rogue Creamery a run for its money, but they're out to do nothing less than revolutionize the practice of cheese-making in Vermont (if not the country). Oh, and just to throw something else in the mix, they're breaking ground this week on a $1.6 million dollar, 8,000 square foot climate-controlled series of five aging caves built into the hillside of their 230-acre property that will be a state-of-the-art facility for other cheesemakers in the region. This from a pair of brothers, Mateo and Andy Kehler (that's Mateo in the photo), who originally bought the property in 1998 having no idea what they'd do with it. Maybe farmstead beer, or baked tofu from their own soybeans. Or, because it's popular at the moment in Vermont, cheese made from sheep's milk. But, thankfully for the rest of us, they settled on cow's milk and a sustainable model that they're intent on sharing with the rest of the state's small family farms, taking the grass that each farms grows, feeding it to their milk cows and, from that milk, making cheese. All right there on the farm. Then, as in the French model, the cheese from that farm is taken to a central aging cellar where a professional affineur shepherds it to the ultimate expression of that farm's terroir, which Kehler defines as not only "the taste of the place," but also the expression of an economy, that is, what grows on the land is how the people living on that land make their living. And, lest we forget, the cheeses that Mateo brought with him to Foster & Dobbs were stunning illustrations of this philosophy. We were able to taste not only the products that they provide to their vendors, but he also brought samples of cheeses that are in the process of maturing. So, for example, we were able to sample a piece of Constant Bliss that had been made just two weeks ago and was almost cheesecake-like in consistency with a fresh, yeasty taste and only a film of rind developing. Then a sample of it at about four weeks of age that had a thicker rind and was getting that gooey character at the edge, as well as a much saltier flavor, and finally a market-ready 60-day-old mature sample that was meltingly delicious with a spicy, acidic character. I can only wish these guys the best, though at this point, as the awards and accolades pile up (they even made it on the Today show), it looks like they've got a success, if not a budding revolution, on their hands. Photo on right: Jasper Farms cheeses, clockwise from top: Constant Bliss at 60 days, 30 days and 14 days; Cabot Clothbound Cheddar; Aspenhurst, a Leicester-style clothbound cheese; Winnemere, a soft, aromatic cheese wrapped in spruce lathe and brushed with lambic beer brewed with Jasper Hill's own wild yeasts; Bartlett Blue, a variant of Stilton; Bayley Hazen Blue at 30 days (practically too bitter to eat) and 60 days (balanced and dry). It's been awhile in coming, but due to popular request we're going to finish up the story of the Birthday Bash. 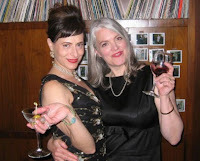 In Part 1, I'd been invited to a themed cocktail party and immediately had a panic attack about what to wear, which was solved by a trip downtown to Ray's Ragtime. In Part 2, the deadline was fast approaching and I still hadn't found shoes till I happened by Payless Shoesource and got the perfect pair. Makeup was a snap with a trip just before the party to Nordstrom and the Lancome counter. Now, this is a free service, but the expectation is that you'll purchase at least one tube of lipstick or a bottle of foundation, so expect it to cost something. And with a bit of hair help from my "sistahs" at Urbino on NW 23rd and a bottle of Champagne for their trouble, I was all set. Arriving at the party, J and K (that's them on the left) had it all together with a spread of jello and snacks that included mini-pigs-in-blankets, dips and chips and a mysterious bottomless bowl of shrimp with cocktail sauce. Bartender Joe (above right) kept everyone well-lubricated, and with the addition of a giant can of those crack olives (that everyone at the party found completely addictive) for the martinis, the evening couldn't have been more perfect. This morning I opened up the FoodDay section of the Oregonian and found that they featured my write-up of the Hollywood Farmers' Market in their Market Watch column. Not only that, but they also included two photos that I'd taken and a link to GoodStuffNW! "The market: Hollywood Farmers Market, Northeast Hancock Street between 44th and 45th avenues; 8 a.m.-1 p.m. Saturdays. "What caught her eye: Baby romaine lettuce. Think of tender baby butter lettuce, but with more structure. The tiny heads (3 to 4 inches long) would be perfect for a dinner party, served one per person and drizzled with a tarragon vinaigrette. Wintergreen Farms sells them for $1 each, or six for $5. Sweet Leaf Farm has them for $1 each. Both farms say they should have these for at least the next couple of weeks. 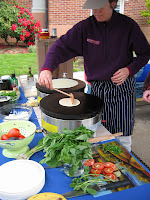 "Also look for Village Creperie, which, in addition to sweet or savory crepes, each week offers a seasonal crepe. The day I visited it was a Fiesta Crepe in honor of Cinco de Mayo, made with cheese, roasted red peppers, black beans, pepper jelly, cilantro, jalapeños, avocado and creme fraiche ($5). "Captions: Baby romaine is not only adorable, it's more tender that the adult form, yet has more structure than baby butter lettuce. "If the gorgeous produce at the Hollywood Farmers Market inspires your appetite, pick up a sweet or savory crepe freshly made at Village Creperie." Do you remember high school? And how the really popular kids all seemed to be so much more beautiful and wonderful than everyone else? And how when you got out of high school you realized it was just an illusion that was perpetrated by the popular kids themselves? Sometimes it's the same thing in the real world. For instance, it's hard to know whether we like the fish'n'chips at the Laurelwood brewpub in Hollywood because they genuinely are the best fish'n'chips in town, or if it's the fact that their beer is so far superior to anything anyone else brews that their very decent fish'n'chips seem that much better, too. Other joints bread their fish with something resembling that stuff called gak that you made for your kids out of white glue and liquid starch. Then they drop it in a deep fryer till it turns brown on the outside but remains gluey inside. And when you bite into it, the hot gak burns your mouth and the pathetic little piece of fish falls out into your lap. And don't get me started on the fries. They're usually the size of wood lathe and about as tasty. 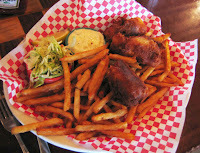 So I'll take the lightly beer-battered halibut at Laurelwood and munch on their perfectly adequate, crunchy fries, thank you. If you've found some pretty darn good fish'n'chips of your own, let us know by clicking on the comments button below. We're always looking for more excuses to drink beer! Details: Laurelwood Public House and Brewery, 1728 NE 40th Ave. Phone 503-282-0622. Some people look for the first robin, some people wait for the opening of their neighborhood farmers' market, others look for the mailman to start wearing shorts. Me, I yearn for the first pinkish green stalks of rhubarb to appear in the produce aisle. Growing up, my grandmother always canned jars of rhubarb sauce that would be served for dessert after the noonday meal (called "dinner," not lunch). Of course, my grandfather would douse it with half a sugarbowl of refined sweetness, but I ate it straight from the jar, savoring each strangely appealing bite, feeling the tart/sweet taste in my mouth. I was even known to take a stalk, cut off the poisonous leaf (which we'd sometimes tie on our heads with string for an impromptu sunhat) and munch on the raw article, prompting much pursing of lips and choking from surrounding brothers and cousins. But I loved it. Which probably accounts for my continuing love of rhubarb in just about any form, though I admit to a loathing of the bastardized version that cuts its wonderfulness with strawberries. So far I've made a rhubarb pie and a couple of crisps. Yet every time I have it, it somehow tastes new to me. So I'll continue to make more until the season ends, summer comes and I can look for the signs of spring again next year. Unlike his cheery, black-mustachioed video-game brother, Mario Batali is battling a very bad image as presented in Heat: An Amateur's Adventures as Kitchen Slave, Line Cook, Pasta-Maker, and Apprentice to a Dante-Quoting Butcher in Tuscany by Bill Buford. Apparently Batali, according to Buford, is an insecure, over-testosteroned p---k who shoves food in his kitchen staff's mouths and forces them to repeat his words that it's what America is craving. Nice guy. 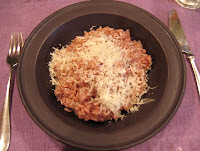 In a recent New York Times article, writer Julie Moskin compared a risotto made with a $70 Barolo (as called for in Mario's recipe) with one made from a bottle of Charles Shaw Cabernet Sauvignon (closer to what Mario actually uses in his restaurant). In a blind tasting by the NYT dining staff, the Charles Shaw won hands down. The Barolo version was described as "'least flavorful,' 'sharp edges' and 'sour.'" I decided to try this experiment in our own GoodStuffNW test kitchen, using a cup of 2004 Mas Donis "Montsant" as a substitute for the Barolo and my two faithful test kitchen staffers as judges. Again, the cheaper wine was judged as "great" and "really great." 'Nuff said. You can download a version of the NY Times recipe here and try it in your own test kitchen. Two days, two lunches, weather so fabulous you can dine outside in shirtsleeves in early May...does it get better than this? The crowd roars, "NO!" Picked up a pal and ventured down the street (again) to Mississippi and Bryan Steelman's ¿Por Que No? 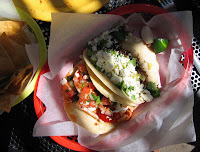 Taqueria to check out their sidewalk dining scene. The bench along the bright pink stucco wall is now covered by a lovely arbor and lined with tiny lanterns, making it the perfect outdoor dining scene that will remind you of an evening on the malecon in Vallarta. We started with their Hibicus Flower Tea, a pint of deep ruby liquid with a hint of lime, and some of their guacamole and salsa with house-made chips, crisp wedges of fried tortilla that are thick and light without being leathery. Then came two tacos, a calamari (left in photo) and their amazing carnitas. The calamari, which I'd never had before, is super fresh with a sprinkling of pico de gallo, queso fresca and their smooth, deeply flavored house chile sauce. The day, the sun, the company and a terrific lunch. Suffice it to say I feel like the luckiest of persons! Then today I picked up the Mama from her bachelorette pad and we drove over to Nostrana for a little pre-Mother's Day celebration. Once again, I was bowled over by the room (maybe half full rather than the crowds it draws at dinner), the service (Mark had my mother's heart fluttering with all the attention) and, of course, their incredible food. If this isn't one of the best places in town to have lunch, then I'll just have to turn in my badge. We started with an asparagus and sweet pea salad with shaved Parmigiano. Now, on a normal day this would be a great starter salad, but they not only peeled but shaved the barely cooked asparagus into slender slices, picked only the tenderest curls and leaves of the pea shoots and topped it all with a barely poached egg. Yikes! Then we moved on to the Nostrana salad, their take on a classic Caesar, made with radicchio and with a light, creamy touch on the dressing. Plus a pesto pizza straight from the wood-fired oven that was blazing away behind the bar. Mark had poured us each a glass of the Canalicchio Rosso di Montalcino, though he seemed a little puzzled that we weren't having white wine with our food choices. What can I say? Rosso rocks! We were going to leave after our coffee, but we saw a panna cotta float by on its way to another table, so since Mom had never had one and it's so hard to explain what makes it so incredibly wonderful, I ordered one for her. "It's small," I said. "Hardly any calories." It came, a little round of creamy perfection, with a drizzling of rhubarb sauce that had us in orbit. Plus Mark's explanation that the texture, according to the Italians, "should be like a mature breast, not a young one." Did I tell you he's great with the ladies or what? Details: ¿Por Que No? Tacqueria, 3524 N. Mississippi. Phone 503-467-4149. 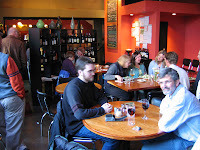 Nostrana, 1401 SE Morrison; Phone 503-234-2427. You run across some incredible stuff on the web. While perusing one of Portlander Deb on the Web's recent posts about something amazing, something charitable, something she must have and something she must eat, there was also something she found maddening. It was a post from Shippenburg (PA) University English professor and poet Kazim Ali about taking out the trash. What's maddening about that, you might well ask? Did he not pull out his recyclables? Did he not separate his glass from his plastic? It turns out that what is maddening about Kazim Ali's trash is that when he pulled up to the university trash bins, took out a box of poetry manuscripts to recycle and put it next to the bins, a person from the ROTC building next door called the local police and said that "a man of Middle Eastern descent...had just placed a box next to the trash can." "Because of my recycling the bomb squad came, the state police came. Because of my recycling buildings were evacuated, classes were canceled, campus was closed. No. Not because of my recycling. Because of my dark body. No. Not because of my dark body. Because of his fear. Because of the way he saw me. Because of the culture of fear, mistrust, hatred, and suspicion that is carefully cultivated in the media, by the government, by people who claim to want to keep us safe. "These are the days of orange alert, school lock-downs, and endless war. We are preparing for it, training for it, looking for it, and so of course, in the most innocuous of places - a professor wanting to hurry home, hefting his box of discarded poetry - we find it. "That man in the parking lot didn't even see me. He saw my darkness." And when it was discovered that his recycling was, indeed, just that, did the police apologize to Ali for the trouble? No, they told him that he needed to be more careful about how he behaved. The university told him that the young man's call had nothing to do with his race or ethnic background, and that they appreciated his "cooperation during the incident and remind everyone that safety is a joint effort by all members of the campus community." I don't know about you, but his story scares me to pieces. When the big guys start to notice you, then you know you're on the right track. Our very good friends Bruce and Mary at Bread and Ink Café on Hawthorne have been getting a nice little bit of attention lately from Splendid Table regulars and road food mavens Jane and Michael Stern. "You must eat crab when you visit the Pacific Northwest, especially if it’s the local Dungeness. This sandwich is a multi-napkin job. It’s open-faced, so it’s your call if you want to eat it with a knife and fork. You can pick it up, though there’s bound to be some slippage and drippage. 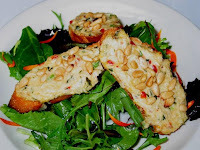 But that’s the fun of the crab bruschetta. It can be a tasty hors d’oeuvre or a satisfying meal." The review was also picked up by Southwest Airlines Spirit Magazine, and Mary says people have been coming in from as far away as Missouri and Birmingham, Alabama, just to have it. Big congrats, guys! Details: Bread and Ink Café, 3610 SE Hawthorne Blvd. Open daily for breakfast, lunch and dinner. Phone 503-239-4756. What is it about spring that makes Oregonians so happy? A few hours of sunshine and we're like hippies after eating a few magic brownies, all smiley and dopey and talking to strangers like best friends we haven't seen in ages. Is it the parting of the clouds, or could it be all the energy that's bursting out of the soggy ground and filling the air with perfumes of green and earth and blossoms? Whatever the reason, it's a time when gardeners are opening their own plots for visitors to tour and ooh and ahh over their heucheras and aquilegia. A great one is coming up on Saturday, May 12, when the Garden Conservancy is sponsoring their Portland Open Day tour of five of the best private gardens in the area. Among those featured are Terra Nova Nurseries founder Dan Heims' home garden, a chance to tour a mature planting of shade perennials and Japanese maples; garden writer and author Barbara Blossom Ashmun's home garden spanning 20 years of experiments with borders and bird habitats; and a rare opportunity to see the internationally acclaimed Jane Kerr Platt Garden, a collector's garden that is 60 years old and covers 2 1/2 acres surrounding the Platt's home designed by Pietro Belluschi. So get out there and start collecting ideas for your home garden. As adman David Ogilvy advised in his autobiography, Confessions of an Advertising Man, "Search the world and steal the best." This event sounds like a don't-miss day for those not averse to heeding his words of wisdom! Details: Portland Open Day tour of local gardens benefiting the Garden Conservancy and the Hardy Plant Society of Oregon. Sat., May 12. Admission $5 per garden at each location or book of six tickets for $25 available online or by phone. Phone 888-842-2442. Dinners always have an edge of ambivalence for me. While it's fun to try a new recipe or pull an old favorite out for the troops, sometimes it's hard to work up the psychic energy to go at it one more time even if the larder is adequately stocked to pull a meal together. Last night was one of those nights and Dave, bless his heart, got home from work, made me a martini (very dry, shaken, with four, yes four, of those addictive anchovy-stuffed green olives from Spain) and agreed it was a good idea to go out. We decided to head across the river to Justa Pasta, which we hadn't tried since they opened for dinner awhile ago and that had been raved by my brother in his blog. Though it was prime dinner hour the small dining room wasn't packed, so we ordered at the counter and sat down with our wine and watched as some great-looking caesar salads and big plates of their house spaghetti with meatballs were delivered to nearby tables. This place has it going on with perfectly cooked pasta that they make fresh every day and a casual but not sloppy bistro vibe. 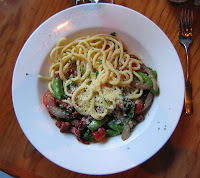 Dave had ordered the bucatini with hot sopressata and seasonal vegetables (above right), which included snow peas, chard and cherry tomatoes, all with a nice al dente texture and snappy flavor. The dude and I ordered the linguine with smoked bacon, spinach and asparagus in a light cream sauce and it, too, was perfectly cooked, with just the right amount of garlic-scented cream sauce clinging to the pasta and the very meaty applewood smoked bacon from Nueske's (gotta source some of that right away!). A dinner for two with entrée and wine is going to run about $35, so it's not a cheap choice but one that's a great value for the quality, and you'll get in and out quickly without feeling rushed, making it a good option for those last-minute "let's go out" evenings. Details: Justa Pasta, 1326 Nw 19th (at Pettygrove). Phone 503-243-2249. Ya gotta love a guy who gets all motivated by the activity next door and decides to build a raised bed for our tomatoes this year. The local paper had an article about how to build one, but no, that was pooh-poohed as not being sturdy enough to last his minimum requirement of twenty years. This, of course, necessitated getting out the computer and drafting a plan of his own, which translates into the opportunity to use as many saws, drills, planes, levels and other tools as he possibly can. After myriad trips to the hardware store to get the cedar, screws and any new tools that might come in handy, he got down to the business of cutting the wood and assembling the materials to make the frame. We had to wait a week or so for the weather and our schedules to clear, then we dug up the lawn, put the frame together and hauled in multiple bags of compost and manure, a solid afternoon of hard work that was rewarded with a very dry martini and toasts to the eventual harvest. 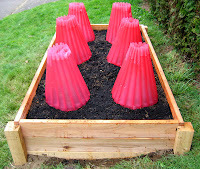 The next day I planted two Cherokee Purple tomatoes, a Brandywine, a Green Zebra, a Black Plum cherry and an Isis Candy cherry, then surrounded them with their red Wall O' Water tomato teepees. 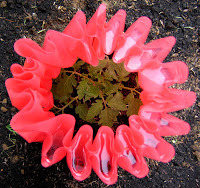 The bases were scattered with basil and arugula seeds and watered liberally. There's room for another bed next to it, which fits nicely into my plan to eliminate as much grass as possible and turn this patch of southern sun into a productive terraced garden. 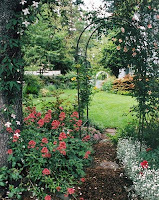 That and get rid of the arbor vitae and replace it with...oh, well, you don't need my whole list. I'll save that for another post! Details: Dave's 20-Year Raised Bed plans available here. Portland may have a reputation as a sleepy backwater populated by Birkenstock and flannel-wearing treehuggers, but there are those who want it to get even slower. 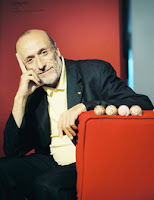 And Carlo Petrini, writer, author and the founder of Slow Food International, is coming to tell us how to do just that. He'll be here on Tuesday, May 8, to talk about changing our industrialized system of food production and consumption by reforming the way our food is grown, prepared, transported and eaten. Why would this guy come to Portland? Believe it or not, our local Portland Slow Food group is the oldest in the U.S., having been established in 1991, and it's still among the largest and most active in the country. So call or e-mail for your free ticket. It should be well worth your time! Details: Slow Food's Carol Petrini delivers the 17th Annual Saward Lecture. Free; Tues., May 8; 7:30-9 pm. Call 503-335-2466 or e-mail for tickets.